Me-time is so essential! I can't stress this out enough. There is no shame in having this one selfish moment, taking the time to totally relax yourself, mentally & physically and just get into a state of indulging happiness. Well, thats how I feel after I have get me some Me-time. Most time people associate me-time with shopping or spa day, which is good but if you have some cash to burn and then by all means, do you boo. but f you just wanna treat yourself during the holiday and don't really want to cough out money then look no further, for I will share with you ways to have a spa day in the comfort of your own home... Yes honey! Labor day holiday is fast approaching, if you live in the US, Sallah if you live in Nigeria, so if you aint got plans, well here's something to do one of the days on this long public holiday weekend. Set up your home into a Spa. Think what makes you feel relaxed. The smell of the place, the look and feel and the sounds. 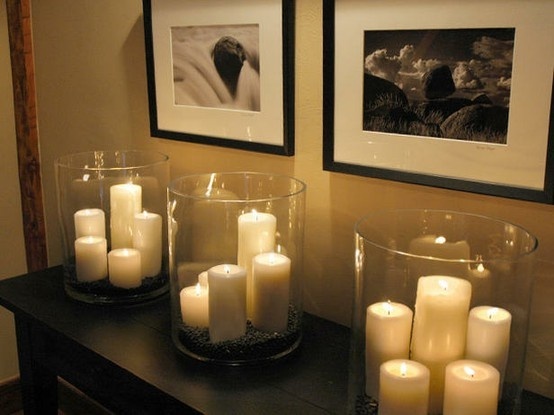 - Set the mood by lighting up some scented candles to really give your home that fresh scent, flowery or citrus (your preference). if you can you can dim the light and let the candle light shine. - Put on some relaxing music or sounds. Me personally, I like to play that soul or RnB (Brian McKnight) music when I really wanna get into the relax sensual mode. But if you prefer the sound of the ocean instead them get that wave sound. Thank God for youtube, you can get what ever playlist you want. - Get comfortable. Time to take off them clothes and slip into a nice house robe, comfy slippers and put on a head wrap, so you hair doesn't get in the way. At this moment you should start to wind down your energy level and just be in a state of comfort and bliss. Ohh its not over, we are just getting started... keep reading. Give your self a deep cleanse facial. If you know me, you know I take my facials very seriously. I would go into details on how I go about a deep cleanse facial, but you can go ahead and read a post I did on it prior, here. To summarize, I scrub, cleanse, steam, and then exfoliate and mask my face. This really helps to clean out the pores where dirt hides and can cause bacteria that eventually will give you acne. So get a good refresher by giving your self a nice facial similar to that of an esthetician. 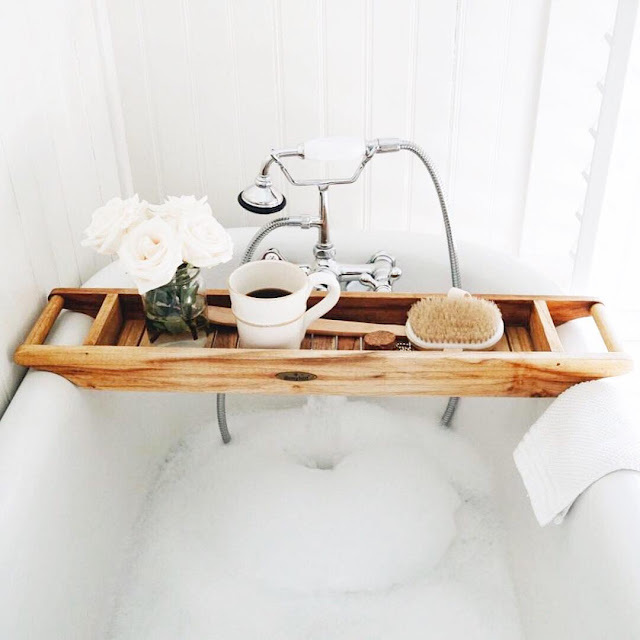 Turn your bathtub into a Luxurious hot tub. The key things you need here is a bath bomb, from Lush Skincare, to lather up the water. Most times they have essential oils in them that are really good for the skin. Also add Epsom Salt, which helps with muscle tension and blood circulation. 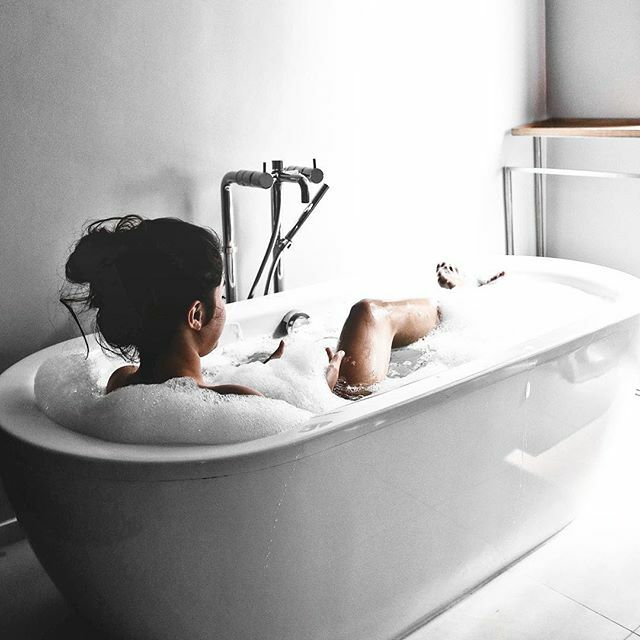 Once you have your warm-hot water filled in the tub and you have your luxurious tub ready, then go ahead and sit in and soak up yourself in it. I like the idea of closing my eyes and just taking in the moment. After about 30 min to an hour I bring out my brush and start to scrub my skin for some deep exfoliation. Once I rinse off, I then massage some moisturizing oil into my skin. Oh I tell you you feel like a million bux at this point. Get on a Sheet mask to get that nice Glow. I really like the Tony Moly Brightening Sheet Masks, because you instantly see your skin looking plump and more radiant. While you have on your sheet mask, you can paint your nails, blow out your hair if it got wet or make some tea, preferably green tea. Have a little ME-Time Self Motivation Session.
" I am Beautiful inside and out. I am a Fearless Queen. I Love You, (insert your name) with all my heart. Go on and be a Shining STAR to this world." Keep repeating it until you start to believe it. Once you do that you are all done. You can either go to bed or be like me, and pour a glass of wine, turn on the tv and see what new show or movie there is to binge watch. And THAT is how you have an awesome pampered day on a public holiday! that gets you super energized for the week to come. How have you pampered yourself lately? I loved your pictures! They are so aesthetic! My pamper time is always all about comfy pjs and essential oils! Thanks! love a pair of comfy PJs! thanks for sharing! Cruise ship spa - Even cruise ships are equipped with spas. This type encompasses a number of components related to well being. Here, you can benefit from cruise tour along with spa within natural gorgeous surroundings.